Kalanchoe (Kalanchoe blossfeldiana) is a tropical plant with succulent leaves. This plant features brilliantly-colored blooms in almost neon shades of orange, yellow, pink and purple, as well as a creamy white cultivar. The Kalanchoe is native to Madagascar and is most often grown in the United States as a houseplant, according to Dr. J. Raymond Kessler, a horticulturist with Auburn University. While relatively easy to care for, this woody shrub can suffer from a few diseases. Powdery mildew is a disease that often affects kalanchoe. This fungal disease flourishes in the warm, humid environment required by the plant. In most shrubs, powdery mildew manifests as a white, powdery coating that covers the leaves and twigs of the plant. In the case of kalanchoe, however, very fine webbing develops between the leaves and stems, according to Millie Davenport, a horticulturist with Clemson University. The leaves of the plant may also develop spots or dead areas. New blooms may be disfigured, or the plant mail fail to bloom at all. Powdery mildew can be prevented by watering carefully to avoid getting water on the foliage, as the fungi that cause powdery mildew travel on water. Make sure there is plenty of air flow around the plant also, as this will help quickly dry up any stray moisture lingering on the leaves. If powdery mildew is still a problem, an application of a fungicide containing potassium bicarbonate can help control the disease, according to Davenport. Phytophthora is a disease that sometimes affects kalanchoe plants, according to Dr. Kessler. This fungus lives in the soil and thrives when the soil is kept continually wet. For this reason, kalanchoe plants should not be left sitting in very wet soil, or watered too often. The fungus attacks the roots, moving upwards into the kalanchoe and killing the inner part of the plant. 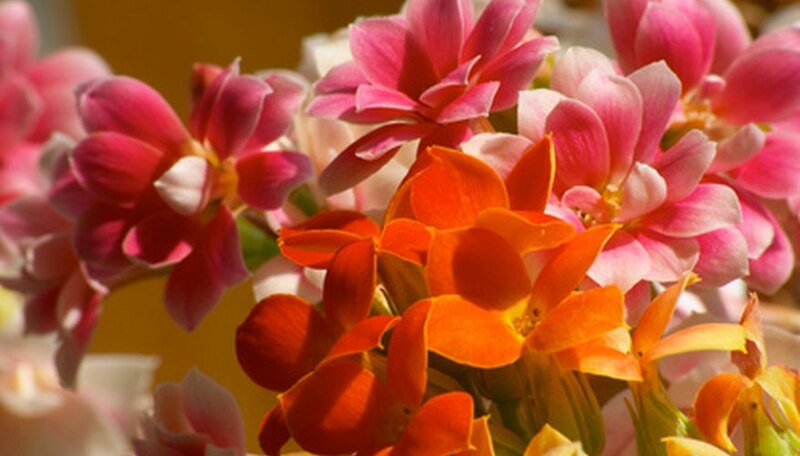 The kalanchoe will begin to show signs of decline, with wilting, yellowing leaves and blooms that drop from the plant before opening. Death of the plant can be sudden or gradual. This disease can be prevented by planting the kalanchoe in well-draining planting medium, such as a mixture that contains a large amount of peat moss and sand. In addition, standing water should never be left in the water catch-tray, and any container used to house your kalanchoe plant should have drainage holes. Pythium is another soil-borne disease that attacks the roots of ornamental plants, including the kalanchoe. Unlike Phytophthora, which travels quickly up the plant to kill the crown and branches, Phythium remains focused on the roots, rotting the root hairs that absorb nutrients. The lower leaves of the kalanchoe will begin to turn yellow as they die from lack of nutrients and water. Over time, the leaves higher on the plant will also begin to turn yellow and shrivel up. Eventually, the plant will die as the roots become completely unusable.